This single level Japanese home is a self-contained cocoon of natural materials that would make a perfect, contemporary home for a small family. 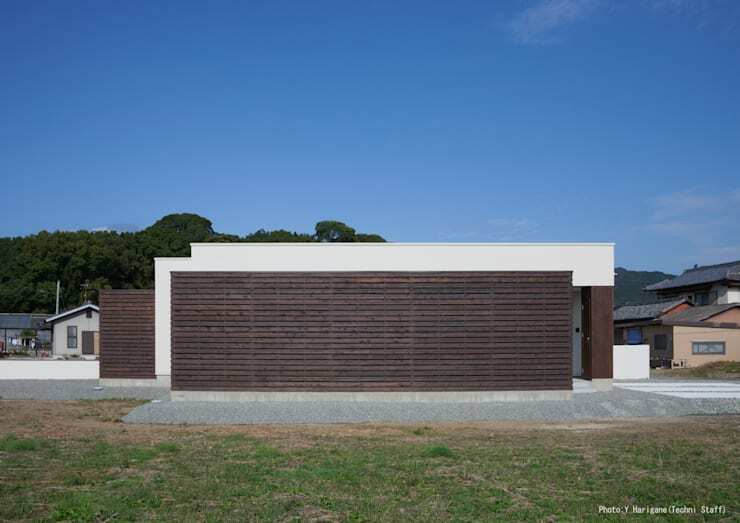 There are few if any natural features on the relatively small site to offer privacy and yet Matsuoka Architects has managed to create private spaces in abundance. The dark timber panelling that wraps around one side of the home produces much of the privacy. It also allows the architect to open up one side of the home with large windows, creating a home with an airy spaciousness and lots of natural light. But it's the subtle choices in the use of colour, lines and carefully planned bespoke furniture that this home really shines. Let's take a closer look in pictures. From this rear view, we can see the dark timber panelling that wraps around one side of the home. At the same time, gaps in the timber allow all-important light to filter into the home. Windows and the careful framing of natural views are an important part of Japanese architecture, so it's interesting that the architect has chosen not to install any windows here. While this may be an untraditional choice, the rough surface of the wooden finish clearly reflects the traditional Japanese respect for imperfection. From the rear entrance of the home, we come to the outdoor entertaining area. While the home may be situated in a relatively condensed area, there is abundant privacy. 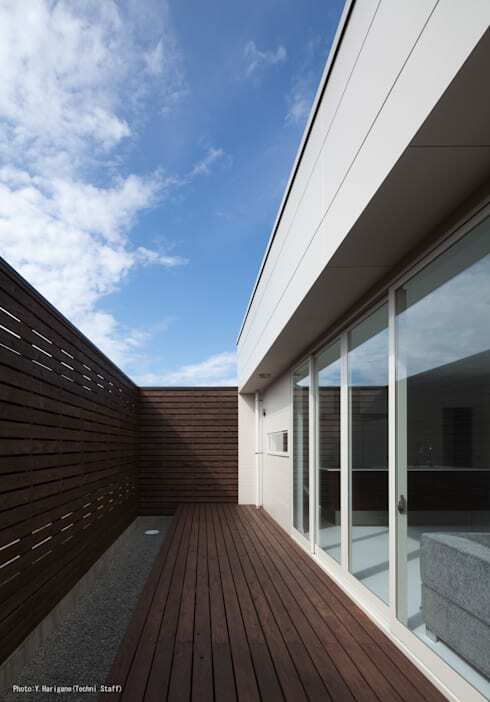 The simple, uncluttered lines of the wooden deck work in parallel with the white roof of the house to create a contemporary, minimalist style. While there are no windows at chest height, there are plenty of outdoor elements here. The wide open sky is beautifully framed by the building, recessed ground lighting and a stone garden provide the barest of Japanese gardens and the large, white sliding doors promise an open flow of indoor and outdoor living. 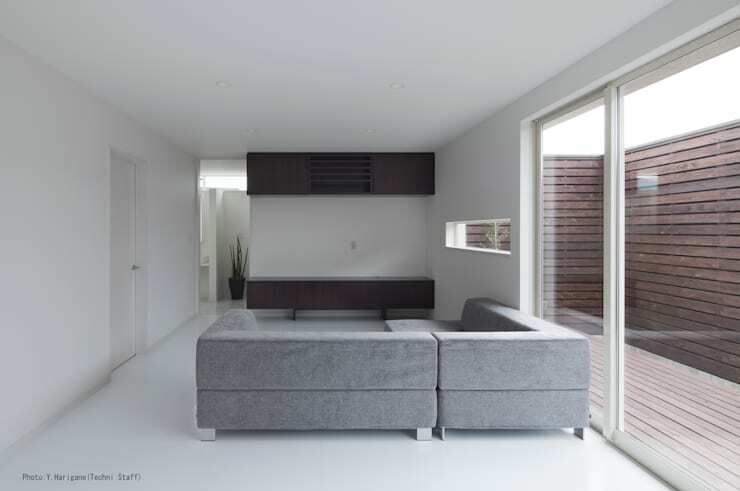 As with many contemporary Japanese homes, this living room initially gives off the impression of stark minimalism. But on second glance, this is quickly followed by an appreciation for the subtle detailing and careful use of natural finishes. The shape of the bespoke wooden television cabinet is mirrored in the thin and narrow shape of the window. The mute grey modular sofa is carefully arranged to create a clear line of sight across the room. A colour palette of white, grey, natural wood grains and lots of abundant use of white create a living room with a contemporary, spacious ambience. 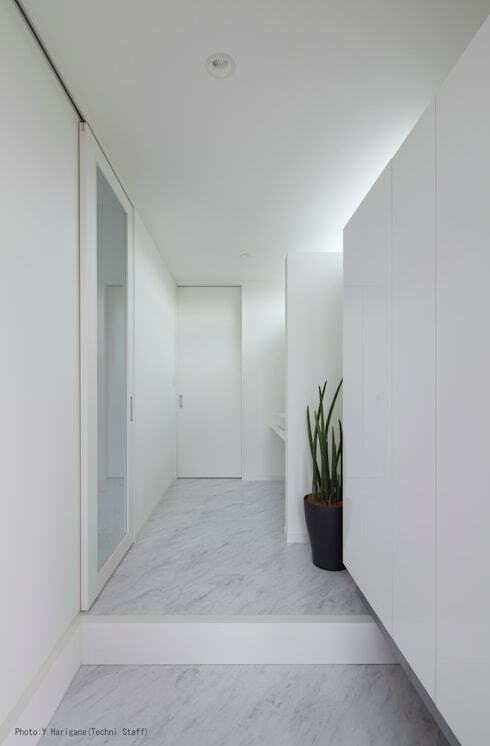 This very simple corridor may consist of white walls, a white marble floor and a sliding glass door, but it also contains a whole host of subtle design decisions. In Japanese architecture, a step is highly symbolic of the mental transition of moving from one point or activity in a house to another. Here we can see how the subtle step has been framed in white to distinguish itself from the rest of the marble floor. The light colour scheme is continued here in the white family bathroom. His and her bathroom sinks and wide mirrors are a generous addition to the room. 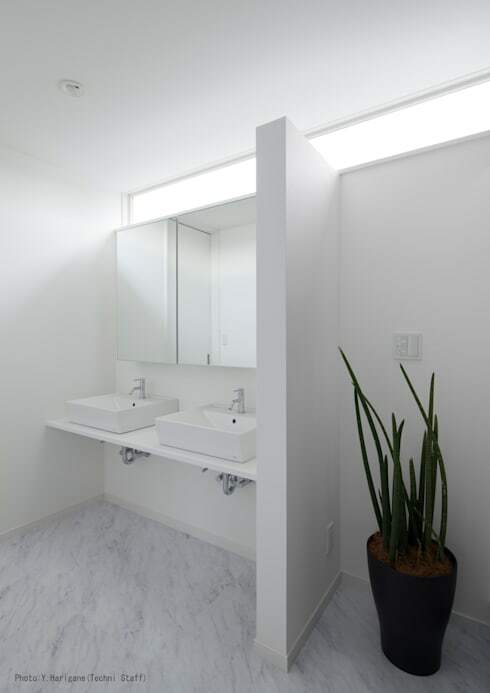 A single house plant offers natural decoration while a high window panel runs along the length of the bathroom to provide privacy and floods of sunlight. Finally, we come to the front facade of the home. The white walls and wooden panelling here create a facade with a contemporary Japanese ambience. At the same time, the architect has considered the privacy of the homes occupants by installing a single, long window panel far above eye level. The simple stone front garden is planted with a single tree lit with accent lighting. The shadows of this tree are no casual addition to the design for in Japanese architecture, shadows are an integral part of the design process. If you are interested in Japanese architecture, you would love this Ideabook The Peaceful Home in the Woods. 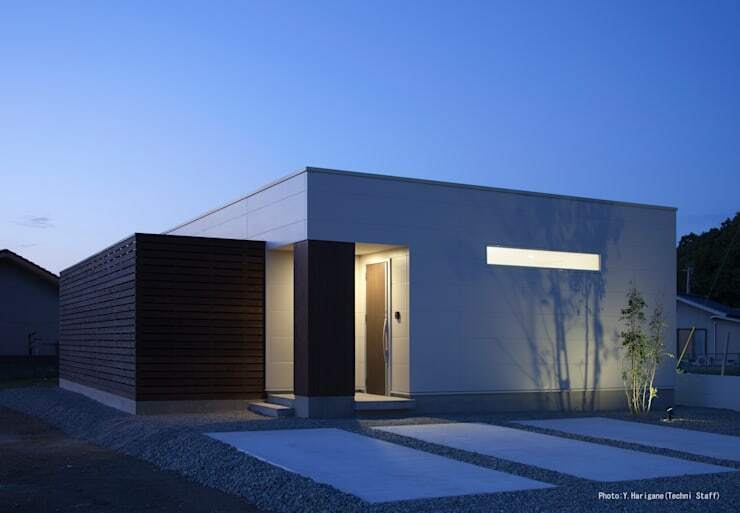 What do you think of this simple Japanese home? We’d love to hear in the comments below!